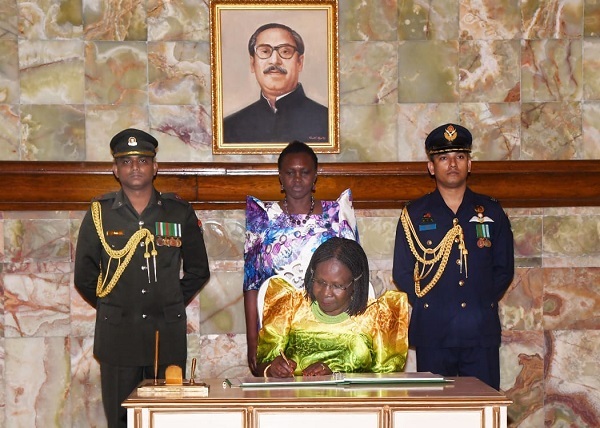 On 7th November, President Abdul Hamid, President of the Peoples Republic of Bangladesh, received credentials from Ugandan High Commissioner, H.E. Grace Akello who is based in New Delhi. The colorful ceremony included a welcome by mounted Police and an inspection of a guard of honor by the Bangladesh Armed Forces. Meeting Uganda among seven other Ambassadors, resident and nonresident, President Hamidrecalled his visit to Uganda as Speaker of Parliament during the 126th Inter-Parliamentary Union Conference held in Munonyo in 2012. The President expressed fond memories of his visit and praised the excellent quality of Ugandan fruit, especially the pineapple. He urged collaboration between Uganda and Bangladesh in the area of food security, proposing joint rice production in Uganda for both Bangladesh and Ugandan benefits. Ambassador Akello thanked the President for the support given to Uganda by BRAC, a Bangladeshi organization which has carried out poverty reduction activities,especially among the rural youth. She particularly hailed BRAC for its work in the areas of agriculture and food security, microfinance support and support to adolescents, especially girls, in the area of reproductive health. In security and defense, Bangladesh has opened it military college to Uganda for training senior military personnel.